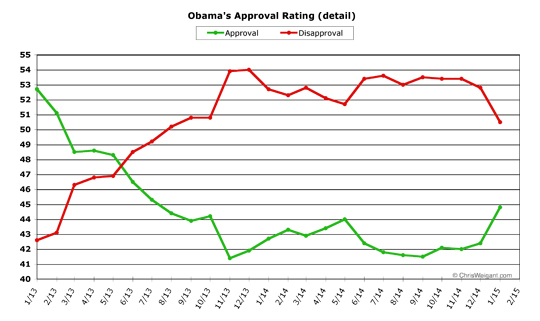 President Obama just finished a very good month in public opinion polling. Obama showed such notable improvement in January that it's tough to choose which metric he did best in. In improvement over the previous month, Obama just had the best month of his second term (so far). His January improvement was the fourth-best of his entire presidency. He hit numbers he hasn't seen since the summer of 2013 -- gaining back all the ground lost (and more) since the disastrous rollout of the Obamacare website. NBC's Chuck Todd, during coverage of Obama's State Of The Union speech, came up with the best metaphor for what has been happening since the midterm elections last year: Obama stole the GOP's "honeymoon." After a big Republican political victory, Obama has been increasingly bold. As a result, Obama got the bump in polling, instead of the Republicans. January was indeed a very good month for President Obama. President Obama exited December with his poll numbers on the rise, and this trend continued even more dramatically all month long. Obama spent the entire month rolling out the new ideas and proposals he would later include in his State Of The Union speech, meaning he didn't just reap one night's benefit from his agenda, he built on it all month long. Seeing as how almost all of these policies are wildly popular with the public, and absent a concerted opposition by Republicans, Americans really only got one positive vision for the future during January. In fact, what Obama called "middle-class economics" in his big speech proved to be so popular that even Republican presidential candidates began sounding a lot like Elizabeth Warren. Mitt Romney, in his brief moment in the spotlight, declared that Republicans should attack poverty. Some of the other GOP hopefuls began echoing this rhetoric. Notably, however, none of them had any constructive ideas for how to achieve any positive changes in this regard (hint to Republican candidates for president: don't just steal Warren's rhetoric, also feel free to get on board with her actual policies). At the end of the month, Obama gave a speech I immediately compared to Ronald Reagan's "morning in America" concept. Finally freed of worries about upcoming elections, Obama starting speaking in positive terms about America's economic future. 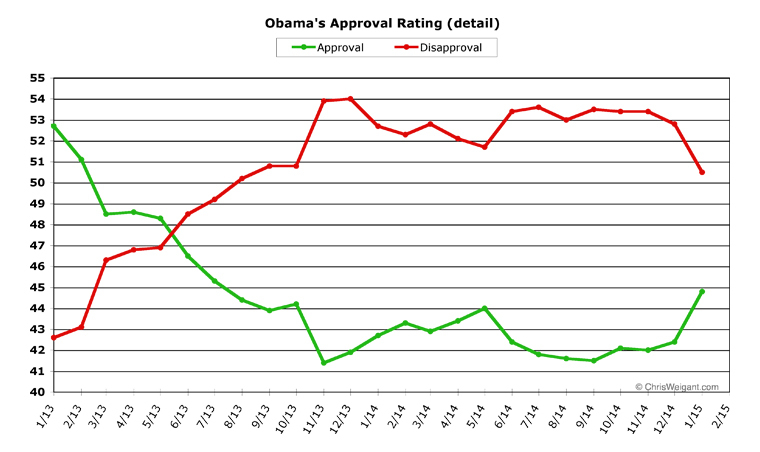 An argument can be made that there are really two aspects to Obama's rise in the polls. The first is all the bold positions Obama has been staking out recently. The second, though, is the fact that more and more Americans are starting to feel better about their economic prospects. The unemployment rate is down to 5.6 percent. The stock market continues to reach new highs. Consumer confidence is on the rise. Gas prices have stayed incredibly low. All of this translates into a general good feeling for millions of Americans who have weathered the storm of the Great Recession. And underlying good feelings of this sort always buoy up presidential approval ratings. It would be tough to identify which is the bigger contributor in driving Obama's polling higher, his own policies or the improvements in the economy. Whatever the ratio, Obama's January numbers were pretty impressive. His average monthly job approval rating hit 44.8 percent -- an improvement of a whopping 2.4 percent over last month. During January, Obama's average job disapproval rate fell to 50.5 percent -- an improvement of 2.3 percent over December. These are the best numbers Obama has seen since August of 2013. In the first month of 2015 (to put it another way), Obama did better than he did during all of 2014. Obama's numbers were still 5.7 percent apart, in the wrong direction (he was "underwater" by this amount), since more people still disapprove of his job performance than approve. But this spread is now half of what it was only two months ago, and Obama improved this measurement from the 10.4 percent underwater it was just last month -- one of the biggest monthly gains he's ever managed (the lowest "underwater" number Obama managed in all of 2014 was 7.7 percent, last May). All in all, an excellent month for President Obama, with the trends pointing to further gains to come. Obama, as I mentioned, had the fourth-best month ever in terms of improving his numbers in one month's time. Taken together, he improved his approval and disapproval ratings by 4.7 points in January. The previous three months which beat this mark were May, 2011 (10.1 percent total improvement), when the death of Osama Bin Laden was announced; December of 2012 (6.4 percent), right after he won re-election; and January of 2011 (5.4 percent), which was, interestingly enough, right after Obama's first major midterm defeat in Congress. To put this all in the proper perspective, and to see the real magnitude of last month's numbers, let's look at a chart that goes back two years (covering Obama's entire second term), in expanded detail. Obama started off two years ago with his own second honeymoon period with the public, but his numbers then fell below 45 percent. The big one-month downward spike was in November of 2013, when the public reacted to the Obamacare website fiasco. Obama very slowly improved for about a half a year afterwards, gaining all his ground back, only to see his numbers tumble once again as the Islamic State crisis exploded, in May of last year. Since that point, he's been scraping 42 percent, with little movement. His polling then started its current impressive rise in mid-December, and continued accelerating in January, as you can plainly see. The trend for Obama's daily numbers within January was crystal-clear: steady and unchanging improvement. He started the month with the lowest daily approval number he'd see during all of January (43.4 percent), and moved steadily upwards to hit the highest daily approval (46.2 percent) on the last day of the month. His disapproval numbers were a bit more jumpy, but still showed a fairly steady downward direction throughout the month, from a high of 52.6 percent to a low (on the last two days of January) of 49.1 percent. There was more movement (a bigger range) in his daily numbers during one month than in all of 2014, as well. One caveat is worth noting, in all this good news for Obama fans. Part of January's polling rise may prove to be temporary, because presidents usually get some sort of "State Of The Union bump" in polling every year. It's the one night of the year (other than Election Day) that more citizens pay attention to politics than anything else. Due to the magnified nature of the stage, presidents often get a "feel-good" rise immediately after the speech, which later proves to be only temporary. But even if this proves to be true, Obama's numbers likely won't fall all the way back. On the night of the speech, Obama had already gained 1.8 percent in daily approval and seen his daily disapproval fall 1.5 percent. So most of his gains actually happened before the speech. 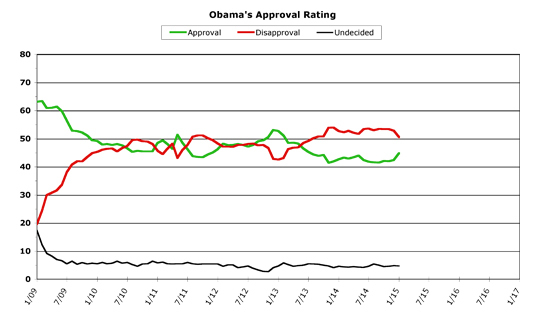 Obama is in excellent position to improve his numbers even more in February. He starts the month over a full percent better than his January monthly averages, in both categories. The economy continues to improve. There is a looming fight with Congress over immigration and Homeland Security funding, but so far congressional Republicans have been pretty disorganized, as they squabble amongst themselves over tactics. Will they really force a mini-shutdown of the department responsible for the safety of America? Or will they have to abandon their attempt to get Obama to reverse course on immigration reform? Obama seems to be holding a much better set of cards in this fight, and the public never likes shutdowns (and always blames Republicans), so we'll have to see what sort of impact this will have on Obama's public approval. Of course, at some point Obama's rising poll trend will top out. The questions to ask are when this will happen, and whether Obama will retain the gains he's made or fall back a bit. I'll offer up three reasonable possibilities for what could happen in February. The first is the most pessimistic. Obama's rise in polling turns out to be mostly a bump from the State Of The Union. The fracas with Congress over immigration gets ugly, and the public sours on politicians from both sides of the aisle. Even if this does come to pass, though, Obama starts the month so strong that his poll numbers will likely merely flatten out in February, rather than take a deep dip. He ends the month with a monthly approval average in the range of 44 to 45 percent, about where he was in January. The second might be called "guarded optimism." Obama continues to improve right up to when the big immigration fight happens, and then falls back a bit. Because he started the month in such good shape, however, the monthly approval average winds up in the range of 45 to 46 percent. The third is total optimism. Obama's rise may top off eventually, but it doesn't do so in February. The public sides with the president in the immigration fight, and rewards Obama for sticking to his principles. The trendline for February equals that of January, and Obama ends up with a monthly average of 46 percent or better (if he perfectly matched his January improvement, this number would actually be 47.2 percent). I'm inclined to believe that the third possibility is the most likely. I'm not normally this much of a Pollyanna, but I did go out on a limb last month and predict that Obama's January would be better than all of 2014, which did indeed come to pass. Right now the trends are looking so good for Obama that I think he'll finish out February above 46 percent, and that he may even see his numbers above water (for the first time in a long time) within the next three months. 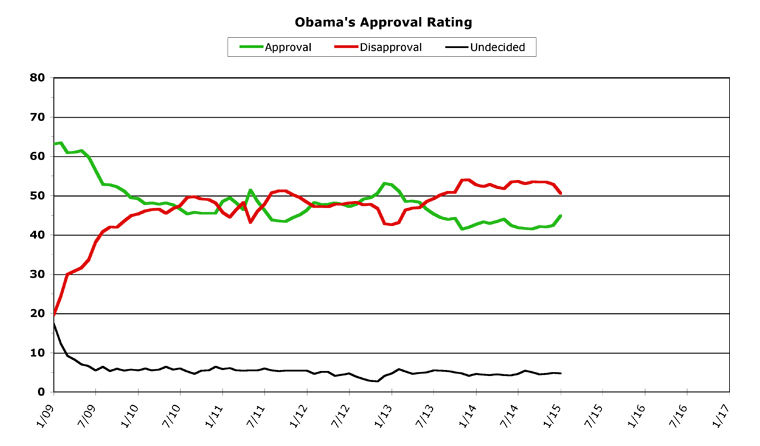 Barring any unforeseen crisis, Obama is well-positioned to continue his improvement in public approval ratings. OK, OK... Bitter though it may be, I have to take my medicine..
"There will come a day when your people will be welcome in Atlantis. But today is that day."